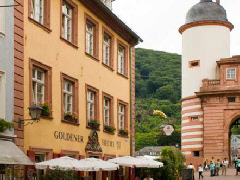 The name translates into English as ‘The Golden Pike’, and since 1717 the Goldener Hecht has been welcoming visitors to the historic town of Heidelberg. Many of its rooms are named after literary figures and poets who have found inspiration in the town: Goethe, Turgeneyev and Mark Twain. Alas, we can’t ascertain if any of the above actually rested at the hotel, but legend has it that while Goethe dined here, he was unable to find any accommodation. Others who did find a place to rest their heads include German writers Joseph Victor von Scheffel, Joseph Freiherr von Eichendorff, Bettina von Arnim, and philosopher Franz Brentano. Family-owned, it offers a select 13 guest rooms, all of which are individually named and decorated. These include the Eichendorf, Elisabeth, Mark Twain and Wilhelm Busch. Gasthaus Goldener Hecht is just a short stroll away from Heidelberg Castle.